Isode Messaging configuration is stored in the directory for M-Switch and M-Box. These servers access their configuration from the directory. MConsole, Isode's Management GUI for messaging, manages configuration in the directory for M-Switch and M-Box. Both M-Switch SMTP and M-Box use directory based configuration, with configuration and user agent information stored in Isode's M-Vault directory. MConsole connects to the directory using an Isode Bind Profile, shared with Isode GUIs that access the directory. Multiple messaging configurations can be managed from MConsole. 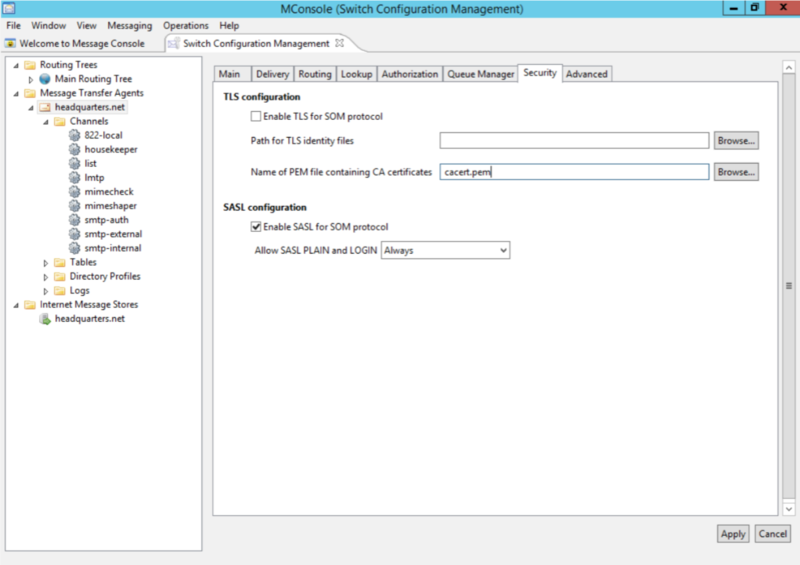 New configurations can be set up and existing ones modified using a configuration wizard, making it easy to set up simple configurations for a range of different purposes, while not imposing any constraints on more complex ones. 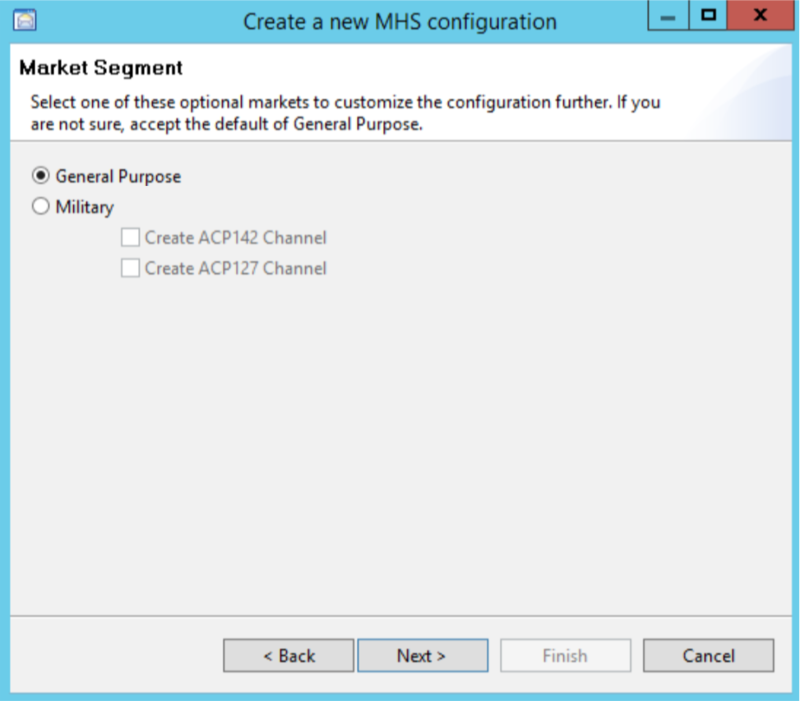 The configuration management screen shown below shows the start of the messaging system configuration wizard, offering the option to generate a military focused configuration (inclusding ACP142 and ACP127 channels) in addition to a General PurposeSMTP configuration. M-Box mailboxes, to enable easy addition of mailboxes to an M-Switch configuration. Redirections, to redirect local addresses to a remote mailbox. File Transfer by Email users for easy support of the M-Switch FTBE capability. X.400 address specification for each mailbox to facilitate per-user MIXER address mappings. The configuration view shown above gives comprehensive access to M-Switch SMTP and M-Box configuration, and overall message routing. The base set of channels can be seen, and tabs for detailed MTA configuration. List members held in directory. Option to expand list by directory search (e.g., membership based on a directory attribute). Strip headers requesting Message Disposition Notification (MDN), to prevent using MDNs to discover list membership. Add List-ID: header to identify list following RFC 2919 “List-Id: A Structured Field and Namespace for the Identification of Mailing Lists”. Configurable option to generate List-Archive:, List-Help:, List-Subscribe:, and List-Unsubscribe: headers following RFC 2369 “The Use of URLs as Meta-Syntax for Core Mail List Commands and their Transport through Message Header Fields” and generation of List-Post: and List-Owner: headers when appropriate. list - only those specified in a configurable list can post.